These workshops are designed to encourage and develop artistic creativity, and to practice the skills involved by challenging the students first to design and then make a small fused glass piece. Young children learn how to pour different colors of glass frit, or granulated glass, into a small jig to create designs that they first work out on paper. 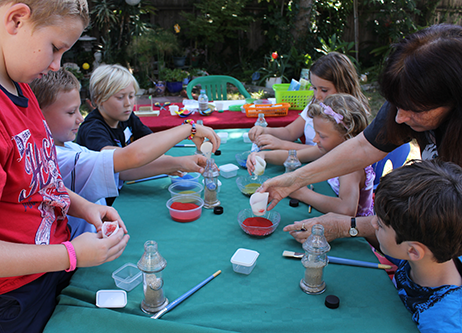 The children are introduced to working with glass by using frit (granulated glass) and a small "jig." This technique is safe; it does not require children to cut sheet glass. 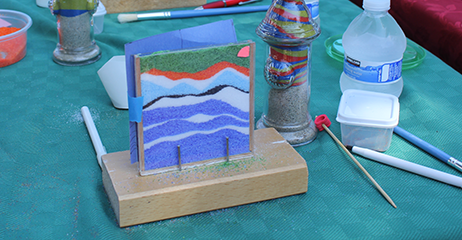 Children practice pouring colored sand into a jig. Materials and kiln time are included in the cost of the workshop. These workshops are held in the Los Angeles area. Children's workshops usually take place during the school year. Introductory workshops are two hours* long; time and date will be set when you make your reservation. Call 818 276-5940 to reserve your spot. *All items created in a workshop must be fired twice. Finished work can be picked up three days after the workshop. Is your child already enrolled in a workshop? If you have signed up for a workshop, please fill out the class enrollment form and waiver and bring it with you to class. For more information, call 818 276-5940. © Ayer of Glass. All rights reserved.